This entry was posted on 31st October 2016 by Tom Richardson. The idea must have seemed irresistible. To confirm or otherwise the rumours and estimations and search for a secret mountain, reported to be higher than Everest. It was one of the objectives that lead in 1932 to the exploration and ultimate ascent of a mountain in a remote corner of Sichuan Province of China called Minya Konka. 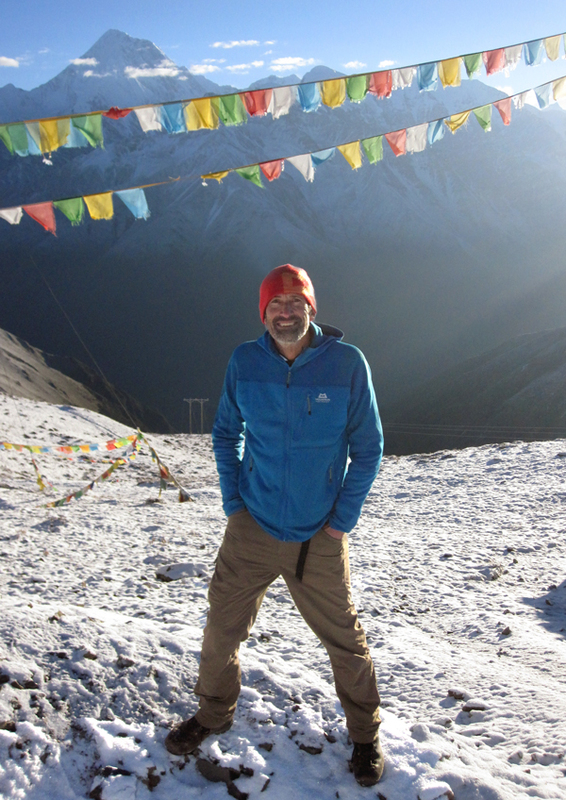 An area that some of us refer to these days as the Tibetan Alps. We know now that Minya Konka isn’t higher than Everest, but it is still 7556 m (Everest being 8848m) and is the highest mountain east of the Himalaya. Such romantic speculation is of course not possible in these days of Google Earth. Whilst all that technological knowledge is great, something special can be lost. Reassuringly though, despite all today’s technology, the best map we found for modern mountain exploration around Minya Konka is still a slightly inaccurate sketch map. The mountain was first climbed by four Americans on the 1932 expedition and they also set an altitude record for American mountaineers that stood for a further 25 years. To put the achievement in context, until 2003, the mountain was only climbed eight times; 22 people reached the summit and 16 died. The 2016 KE Adventure Travel Minya Konka trek lead by me this autumn had rather more modest ambitions. Still it was a huge adventure amid wild, infrequently visited mountains in which we only met one other foreigner, a few Chinese trekkers and at the end a Chinese climbing group heading for one of the many smaller peaks in the area. As well as Minya Konka the range is crammed with beautiful snowy peaks that top out at just below or just above 6000m. It’s a potential alpine playground and nobody has heard about it. Trips to this part of the world start in Chengdu, the world centre for Panda breeding and conservation amongst other things, so you can go and have a look at them too if you are interested in that type of thing. A new highway is being built from Chengdu to Kangding, which is a sort of Chinese Chamonix, nestling in the base of a steep valley with a backdrop of rugged peaks. Our crew consisted of the boss of our agency in Chengdu, two cooks who hadn’t been into the mountains before and 3 excellent Tibetan horseman and their horses. A modest and lightweight set up compared with say a trek in Nepal and certainly much more at the pioneering end of the spectrum. 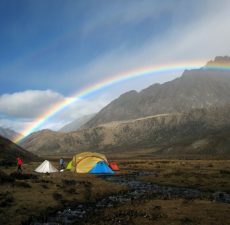 Our trek had an ominous start in thick cloud and rain for the first two days before a wondrous transition to blue skies was hailed by the most magnificent rainbow over our camp. 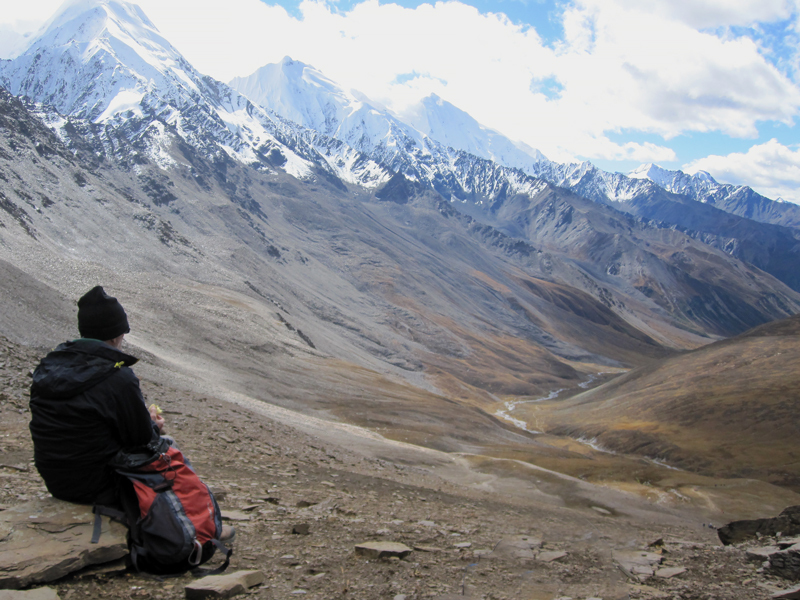 One of the high points of the trek is crossing the 4900m Bhuchu La pass which gives a stunning view down the lengthy Moxi Valley and the line of flanking high peaks. It’s quite hard to trek past and resist the temptation to go up each side valley and explore them. Another time perhaps. After a couple of days trekking down the Moxi Valley we had hoped to get up close and personal with Minya Konka by staying as guests of the monks at the Konka Monastery right below the mountain’s main glacier. It’s a place apparently unchanged by the troubles in both China and the nearby so called Autonomous Region of Tibet since the mid-20th century. Unfortunately, as is often the case it remained coyly wrapped in a blanket of cloud. We were however rewarded a couple of days later after a pre-dawn start and a long wait on another pass, the Tsemi La in the snow as slowly and tantalisingly Minya Konka threw off its cloud cover. It certainly is one of the great mountains of the world and one of the most secretive. 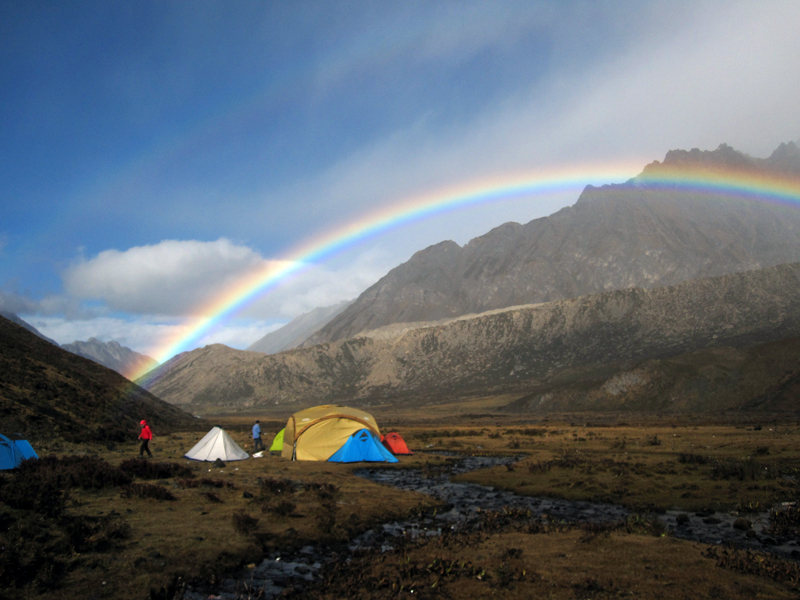 If you want to have a short trip to a region with hardly any foreigners, see some great mountains and experience unchanged Tibetan people and culture, this could be the place. That is until the word gets about, so don’t tell anyone.